Actress Lily Collins attends Hollywood Stands Up To Cancer Event with contributors American Cancer Society and Bristol Myers Squibb hosted by Jim Toth and Reese Witherspoon and the Entertainment Industry Foundation on Tuesday, January 28, 2014 in Culver City, California. Lily Collins kept it casual with this straight center-parted 'do during the Hollywood Stands Up to Cancer event. 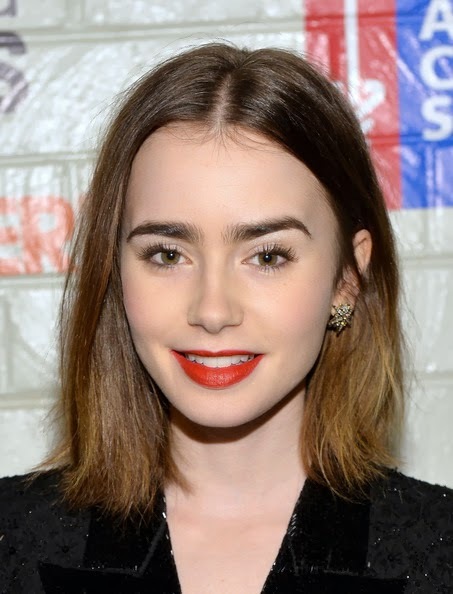 Lily Collins' rich red lipstick looked striking against her pale foundation.